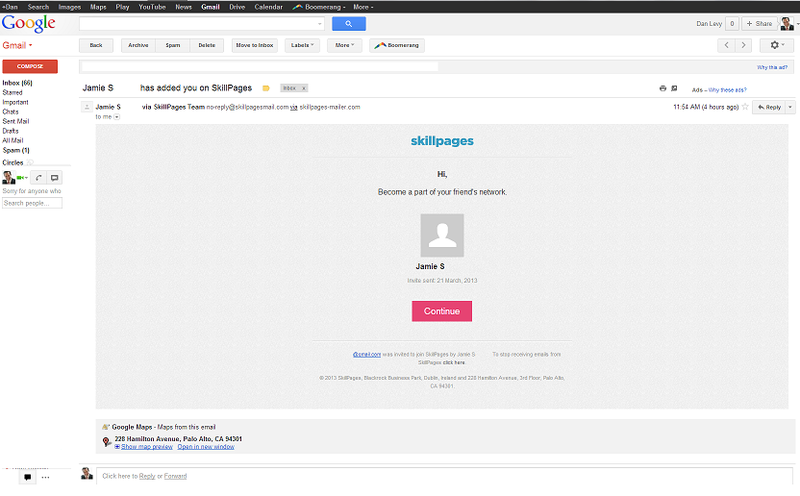 SkillPages Email Spamming: A Warning, a Story, an Apology, & a P.S.A. First, an apology to all of my contacts who I inadvertently spammed. 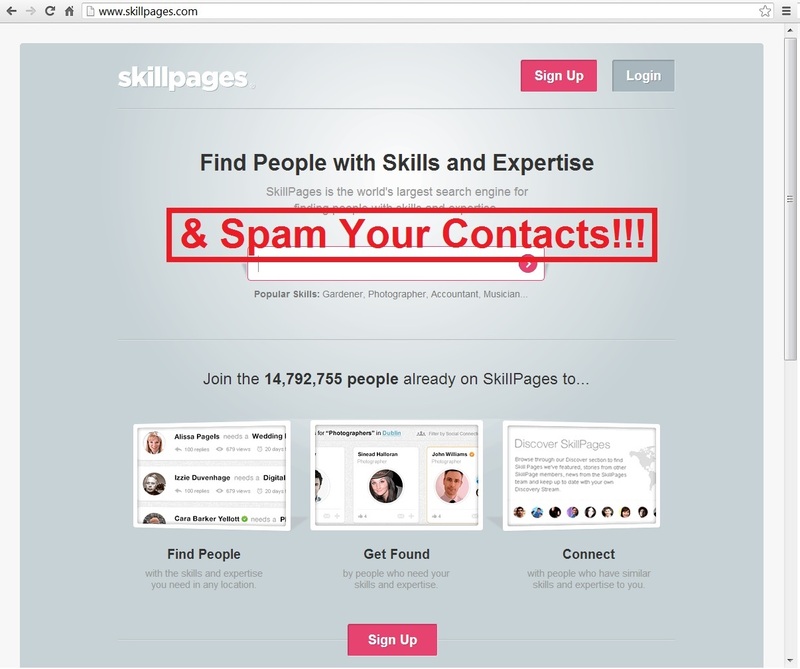 I got taken in by SkillPages a service that is gaining users by spamming contacts of new members as soon as they sign up to the site. I know a bunch of people have written about the new look to Gmail since it was officially launched in the beginning of November (Google blogged about it here). Some people are complaining about the way it was reorganized or certain specific changes like losing text labels and turning them to graphics – most of which I agree with – but no one that I have seen has discussed the lack of color in the new Gmail and how that affects efficiency when composing an email. What do I mean by this? Well take a look at the old Compose Email interface from Gmail previous to their change at the beginning of this month. When I am referring to the color I am not talking about the overall light blue coloring because while that’s nice and all, it seems to be a simple theme change that can still, I think, be achieved within Gmail. What I am referring to is the way that the highlight color icon has a ‘T’ with a yellow background and a small highlighter with a bright yellow tip. At a glance, I can immediately find this when I am composing an email because my eyes are immediately drawn to the bright yellow. Similarly, to the highlight option’s left is the Text Color option which has the same ‘T’ only next to it is a color palette of six different colors. Again, that makes sense logically and conveys the message of what the button does without any words AND the user’s eyes can quickly and easily find it. There is almost no learning curve or memorization required here – it just makes sense. Now let’s look at the new Compose Email interface and look at those same exact buttons. You’ll notice that everything is in the exact same order as it used to be but the loss of color on the buttons makes a huge difference when trying to find specific options at a glance. For some reason, someone at Gmail/Google decided that instead of having a ‘T’ on a yellow background it would make more sense to just put the T on a gray field. Next to it, is a picture of an ‘A’ which is underlined which somehow is supposed to tell me that it is the text color option. The only reason I can think of to switch the symbols themselves – never mind the lack of color – was to make it match the Microsoft Word buttons for the same option but even here Gmail’s designers did a halfway job. Above, you can see the same buttons taken from Microsoft Word 2010 and while the Gmail Text Color option does match Word 2010’s in terms of formatting it only does so if we assume that everyone who is using Gmail/Word 2010 only sees in black and white. As well, if the point here was to copy the Microsoft buttons why did they only copy some of them and not go whole hog and copy them all? However, I must reiterate that the most important issue for me here is the complete lack of color. I am well aware that it is only taking me an extra couple of seconds per email to format things the way I want them formatted but the reasoning for just getting rid of all the colors – which are helpful visual cues – just eludes me. Has anyone else found this to be annoying as well? Did I just bring something to your attention I shouldn’t have because now I’ve ruined it for you too? (If so sorry.) Or am I totally alone on this? Let me know! As for Gmail – do you think you could give us the option to turn colors in the Compose Screen back on? That’d be swell! Is Your Recovery Email Address The Spare House Key You Leave With A Friend? 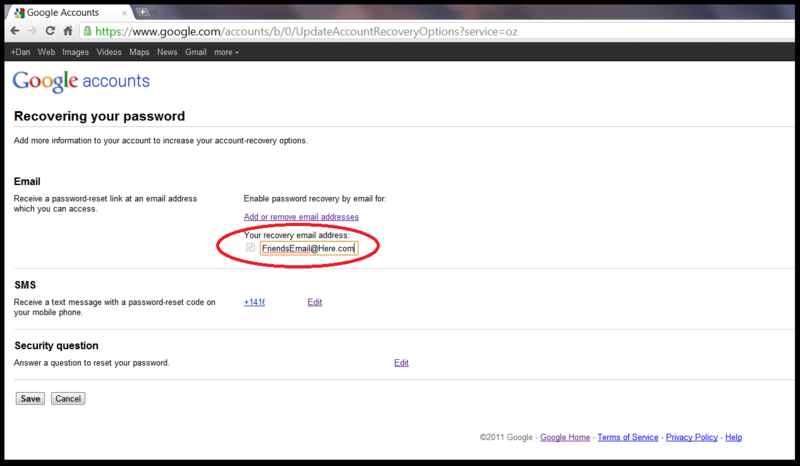 Today I logged into one of my secondary Gmail accounts – I have around 20, not all in use and, yes, I know it is a sickness – to play with a filter and check the spam box and I was given the warning you get every now and again from Google to ensure that the information for password recovery of your Google Account is current. Google warns you as you can see in the picture above “Don’t wait until it’s too late.” Once they have your attention they go on to tell you that, “[u]sers without recovery options are 9 times more likely to lose access to their accounts. Protect your account by making sure your password recovery options are up-to-date.” Sounds like it something we should all make sure we are up to date on, right? Below that line we get the option of changing/setting the phone number that our Google Account is associated with for the purpose of recovering our passwords via SMS (which is another name for a text message and stands for “Short Message Service”). Below that is the line that got me thinking tonight and is the root cause of the little tip I have for you. It also gave rise to the comment on 21st Century culture and society which I have been considering since I thought of this – don’t ask how my brain works and why it goes in the directions it does…it just does and I have long learned to stop trying to reign it in and enjoy the rides it takes me on. “Recovery email address.” That is pretty important and I would hazard a guess that it is more likely than our phone numbers to change. Why do I say this? Well, think about it, a lot of people my age and younger use their Gmail as their primary email account for their personal lives. A work email address is somewhat of a temporary thing with the frequency we change jobs these days. In fact, the email address I had listed in that line was my old York University student email address. I haven’t used that email address in forever and I know that York switched my email to some alumni email address which I never use either so the idea that this was my recovery email address was somewhat perturbing to say the least. I switched the email address to my main Gmail address but still felt it wasn’t the best choice I could have made for my own security. But what could I do? As I said, this wasn’t something I particularly wanted to think about – or ever have to think about – again. If I made it a work email that would be just one more thing I would have to think of when/if I changed jobs. It was then that it dawned on me, the recovery email address was very much akin to a spare house key in this day and age. 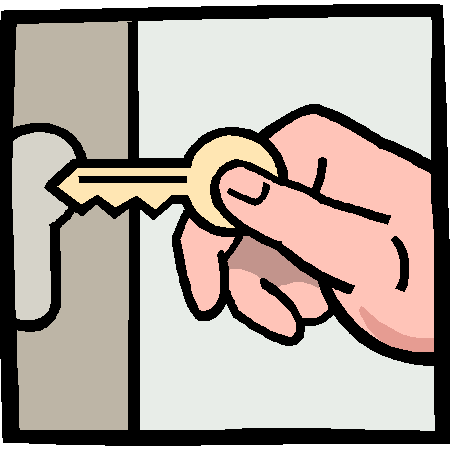 Think about it, we give our spare house keys to our family members or good friends who live nearby or if we don’t have either of those, a neighbor who we trust. We will even often trade keys with those same people because you never know what kind of emergency situation can arise and it is always good to have that spare key handy. Sure, we can go out and buy one of those fake rocks or set up some sort of elaborate hiding place but it is just way, way easier to trust someone else with a copy of our key for emergency situations. Once I realized this I went back into the “Google Accounts – Recovering your password” settings page and made the recovery email address one of my best friend’s email addresses (I, of course, consulted with him before doing this). I am now secure in knowing that my friend always has my back and is my backup for my email password recovery. Further, if anything ever happened to me – a boy scout is always prepared – he can easily access my email if the need arises. Oh, and one very important thing – I trust him completely. What do you think? Good idea? Is my comparison accurate? This year I saw a number of pranks put out there some more amusing than others. One, I took part in on a different blog I write for where we center on cellular devices. We announced at 12:01 AM on April 1 that we had managed to obtain pictures of the iPhone 5. I actually wrote the blog post and made the rudimentary graphic which said “Gotcha!” and wished every one of our readers a happy April Fools’ Day 2011. Apparently people really enjoyed the joke and playing it on their friends because the blog post was retweeted on Twitter 90 times and shared across the internet many, many more times. 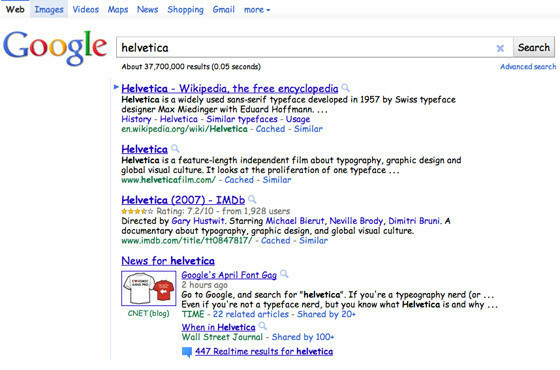 As well, Google put out a number of different ‘pranks’ including one where if you typed the name of the very popular font “Helvetica” into Google the results all appeared in the much maligned “Comic Sans” font as seen in the picture below from Huffington Post (the ‘prank’ is no longer live) article about it. Google played another bunch of jokes on all of us including the idea of Gmail Motion where people would supposedly be able to compose emails and control Gmail entirely via making motions at their webcams. This, naturally, led to a bunch of people over at ICT MxR Lab making it a reality using the Microsoft XBOX 360 Kinect sensor as reported by Tom’s Guide among numerous other places. I have attached the YouTube video of “Gmail Motion” in action using the ICT MxR Lab’s Microsoft XBOX 360 Kinect software below. This being a live news cast in the morning, the co-anchor complied after a couple of seconds of convincing and, well, check out the video linked below to see what happened. As of right now this can also be viewed on YouTube here http://youtu.be/isUFXNYT80k I also embedded it below but I put the above video first because it is official and who knows how much longer this viral video will be available via the YouTube link. Raoul Martinez, in my mind you definitely won April Fools’ Day 2011, pranking someone on live TV during a news broadcast is just absolute, sheer genius! However, if I were you I’d be on the lookout for April Fools’ Day 2012 when your co-anchor Shally Zomorodi is probably going to be getting you back. Remember, revenge is a dish best served cold! Linksys wrt160n SERIOUS Issues! And their Twitter PR people are INCOMPETENT! I have loved using Linksys routers (made by Cisco) for a long time now and recently we bought a new router from Linksys to replace our old wrt54g – the wrt160n version 3. Then in December Linksys-Cisco released a new firmware update for the router. I was overjoyed thinking that FINALLY they were going to be fixing this issue in the new updated firmware…Alas, it was not to be. These blogs and on the above mentioned forum thread all have suggested answers to the problem which include loading the DD-WRT firmware (found @ www.dd-wrt.com/) or switching your computer to a Static DNS so it doesn’t use the router’s DNS (which is obviously corrupted). The problem with the solutions above is that with DD-WRT is a firmware that is made by people other than Linksys and Cisco and while I know it is often seen as being a better option I don’t think I should be forced to go download firmware not covered under my Linksys Cisco warranty to make my Linksys Cisco product work properly. To the other solution, a Static DNS, what happens when other people are trying to use our network or we take one of our netbooks or laptops out of the house? What a pain that will become on both ends. Especially living with non-tech oriented people and being their sole tech support option and being blamed for any and everything that “goes wrong” with technology in the house even if it isn’t your fault! And still not a word from them til this day! just got off the phone with the tech support, they had me change the laptop DNS back to automatic & reset my router, it seems to be working, but we will see for how long. 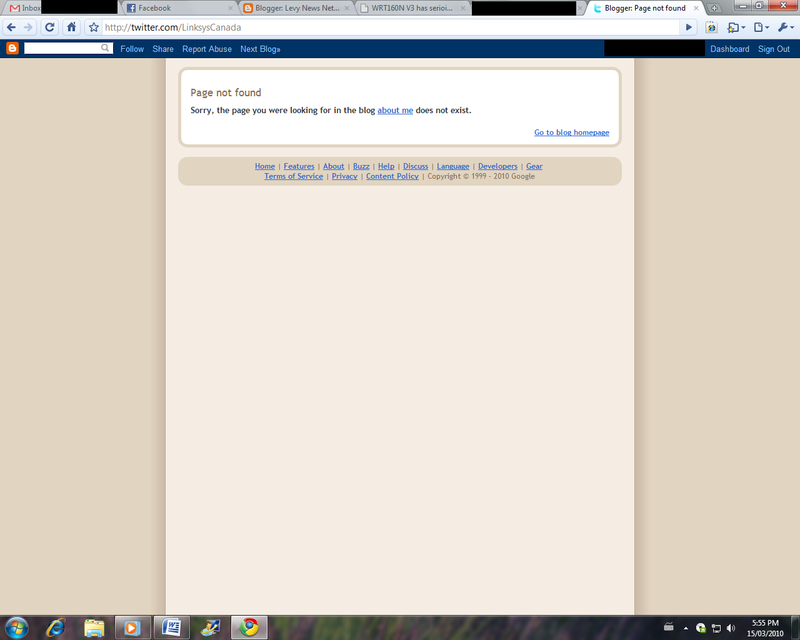 They said if it happes again it could be my ISP or browser, seems that has been ruled out here though. Linksys and Cisco I think it is about time that you dealt with this issue! Release an upgraded version of the firmware already! OR admit that there is a problem with these routers and issue a recall. You also might want to look into the PR group you have hired who are taking care of your online presence and the level of incompetence with which they represent your company…you guys are a tech company remember? A tech company whose business is getting people online, networking, and using the internet. UPDATE: More examples of the Twitter.com redirect which just happened again after a router reset – yes, this is how often it happens, within HOURS. And here is the “About Me” section from that blog. Who is this person? 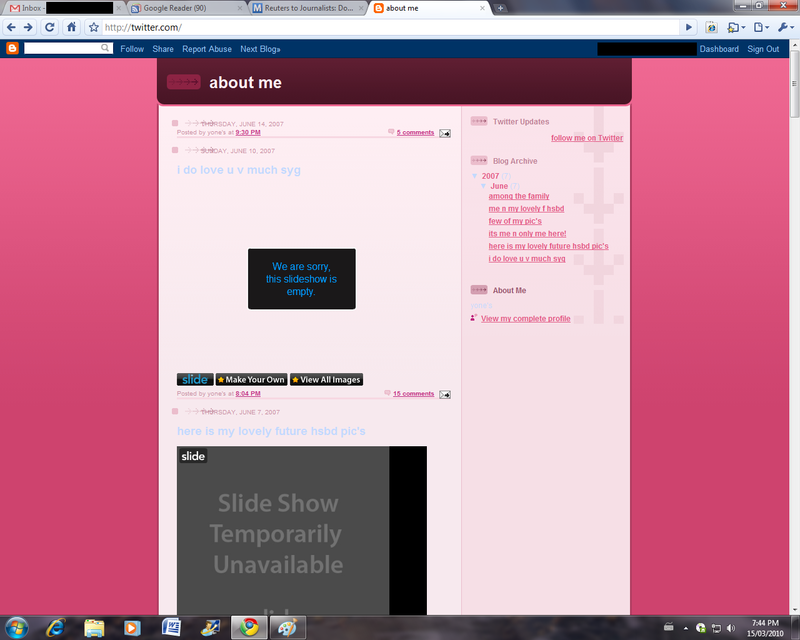 Notice how the “My Web Page” link which I have highlighted goes to some Twitter? Blogger? 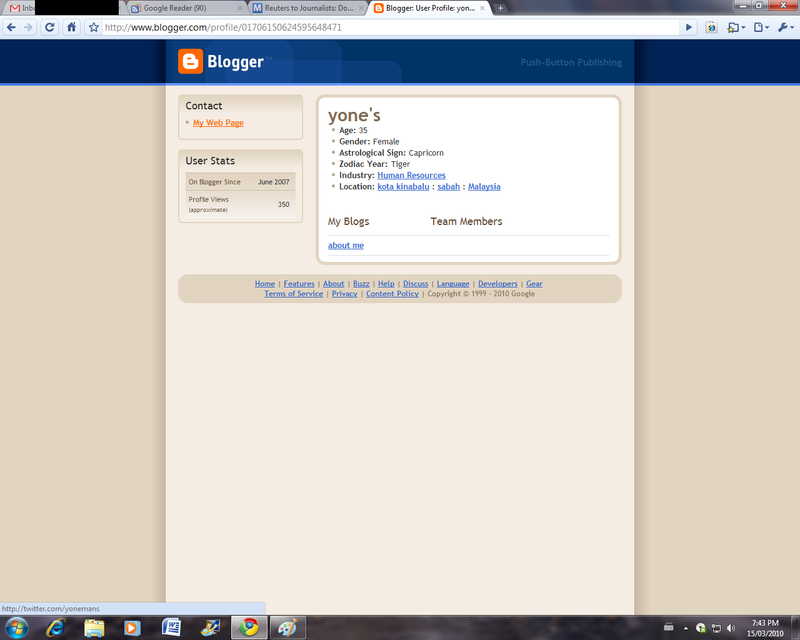 account with the name “yonemans”. Weird! Google Sync Is Messed Up! Don’t Use It! I currently use a BlackBerry Bold 9700 (aka the Bold 2) and this post is in regard to the Google for Mobile application for BB called Google Sync. I have tried to use the GoogleSync app for BlackBerry and in its current incarnation I can only warn others to stay away from it. 1) If the app sees your BlackBerry has too many items listed in it vs what it will sync to your Gmail contact list it just deletes the extraneous stuff. 2) The app doesn’t have a log of what exactly it did other than to tell you the number of contacts “updated”, “deleted”, or “new” this is extremely problematic when you consider reason #1 when it deletes info from your contact list and there isn’t even a log file to tell you what exactly it has done. 3) The app doesn’t allow you to set which contact list – BB or Gmail takes precedence on conflict between the two. Now for the real world application of the problems the above result in. I decided after having a couple of issues with the app previously to try it again but this time to use one of my random Gmail addresses that I never really use and has no contacts saved in it (and before I started I made sure to delete the 2 contacts that were in the Gmail contact list). I then downloaded Google Sync for BB to my 9700 and ran it, setting it to log into the Gmail address which had no contacts stored. How could it have updated contacts when there weren’t any contacts within the Gmail account? What did GoogleSync update the contacts against? Further, what contacts did it “update” (read ‘change and delete some possibly important info’). There is no log of this info so am I now going to either have to go through all 700+ contacts and find where the info I am missing is and attempt to get it back OR just wait for the one day when I need this info and find out that I don’t have it because Google Sync decided to delete it. Good thing I backed up my BB before this experiment! However, this post is a warning to warn anyone else off from using Google Sync for BlackBerry until A LOT of improvements are made to the software.